Compass Media offers basic and all inclusive monthly web design and marketing packages. Work with us and we’ll develop, and action, a plan to update and edit your website regularly, enabling you to promote the products and services your customers are looking for. 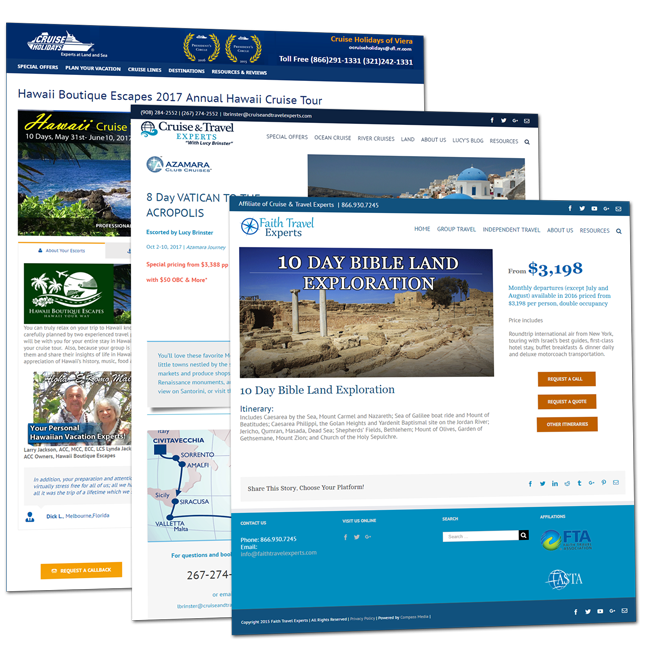 Our team has the expertise in many consortia sponsored websites such as Signature and Travel Leaders to name just a few. We build custom landing pages, implement ongoing SEO strategies , provide essential webmaster services such as link checking, removing expired pages, text and link updates, ongoing site maintenance plus Google analytics monitoring. We’ve also discovered that most clients need help with creating text so we do lots of copywriting also! Our managed custom landing pages offer Calls to Action (CTA) – visuals+text+buttons, to encourage an action. Examples include: purchase, contact forms, register online, request a quote, request a call back, download a flyer, e-newsletter signup, etc. These pages help to increase leads, improve SEO (search engine optimazation) and raise brand awareness. We’ll update existing pages on your website to a more modern design. Contact Us Today! and find out how we can help your business. Powered by WordPress, our websites offer exceptional flexibility and with our managed hosting packages. You never have to worry about security or updates. We take care of every thing. And the best part is, with Compass Media working in conjunction with your consortia and your preferred vendors, we populate your website with current content so it’s always up to date. Request your free, no obligation website assessment and consultation today. No Risk. All Reward.